This week I’m already getting ready for the holidays at the end of this year by knitting small quick projects with scraps and partial balls from last year’s knitting projects. 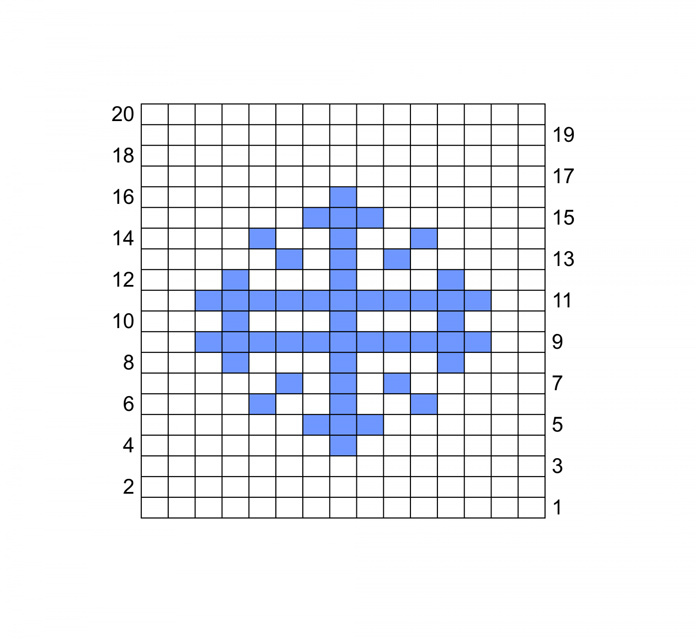 Today I’ll show my attempts at using the double-knitting technique to make a coaster. Either side of my snowflake coaster knit with Radiant Cotton yarn. You don’t have to say it. I know what you’re thinking. These coasters, (well actually THIS coaster as there are two in the photo but it’s the same pattern) look a little rough around the edges, but more accurately said, in the center. While I love Radiant Cotton a Fibra Natura yarn for garments and accessories, (in fact I write about it in depth in my blog post Knitting with Radiant Cotton by Fibra Natura), I should have thought twice about using cotton for the double knitting technique. I was going for the frosty winter look though, and these two colors, the blue is called Winter Blues and the white is called Custard, were the perfect pairing for a little scrappy project. This reversible coaster is perfect to keep those hot tea cups off your furniture. I think cotton yarn makes a lot of sense in a utilitarian project like coasters. It soaks up liquids well. It stands up to machine washing and drying, and it doesn’t pill, so it’ll look crisp and clean for several years. However, I made the mistake of not using small enough needles. I used US 3 [3.25mm] to knit this, but I’ll definitely go down to US 1 [2.25mm] or smaller needles next time I make these coasters. Double knitting means a lot of yarn-overs and yarn-forward and yarn-back-again moves, and all this can easily lead to inconsistencies in tension. A tight gauge can compensate for this and result in much more evenly tension-ed stitches. 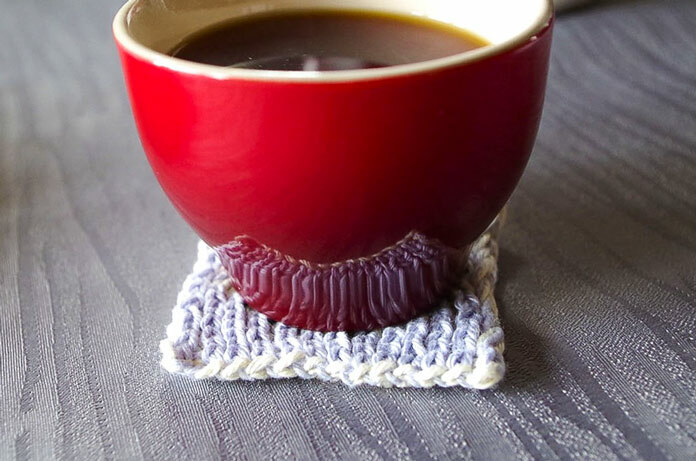 You can make this coaster with any scrap yarns you have about. Whatever size needle you would usually use with the yarn, go down about 2 or 3 knitting needle sizes. Holding both colors together, make a slip knot leaving a 4” [10cm] tail, and place the slip knot on one knitting needle. *Hold the strands of yarn to work a long-tail cast on as usual, and cast on one stitch with the dark color. Then switch the yarns in your hand and cast on with the light color; rep from * 14 more times. You’ll have 30 sts plus the original slip knot, so it will look like 32 sts. Row 1: Holding both yarns together, knit the first light color and dark color stitches together, *k1 with light color, bring both yarns to front, p1 with dark color, take both yarns to back; rep from * across to last 2 sts and slip knot. Holding both yarns together, bring to the front and purl the next light and dark sts together. Drop the slip knot off the left-hand needle unworked. Row 2: Holding both yarns together, knit the first two strands as one stitch, *k1 with dark color, yarn forward with both yarns, p1 with light color, take both yarns to back; rep from * across to last 2 strands, with yarn forward, and holding strands together purl into last 2 strands. Follow the chart beginning on the right side and reading across to the left. 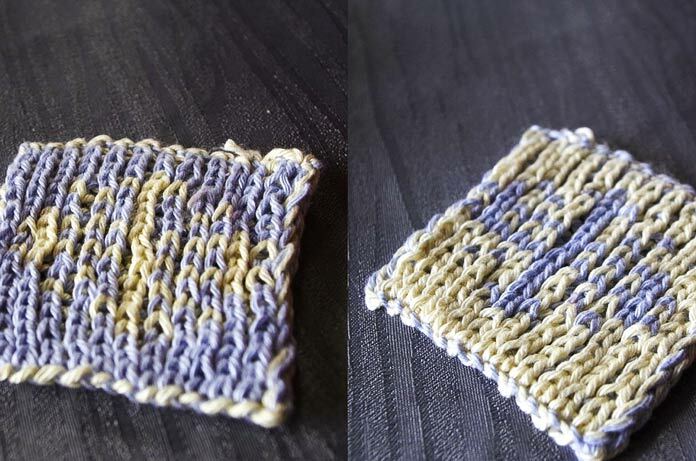 When there’s a different colored square, switch which yarns you knit with and which yarns you purl with. Row 4: With yarns held together, knit first st, [k1 with light colored yarn, yfwd with both, p1 with dark colored yarn, bring both yarns to back] 6 times, k1 with dark colored yarn, yfwd with both, p1 with light colored yarn, bring both yarns to back, rep between [ ] 6 times, with yarns held together purl last st.
On the rows where you read the chart from left to right, the color of square you see is the color of the purl stitch and you use the opposite for the knit stitch. Row 5: With yarns held together, knit first st, [k1 with dark colored yarn, yfwd with both, p1 with light colored yarn, bring both yarns to back] 5 times, *k1 with light colored yarn, yfwd with both, p1 with dark colored yarn, bring both yarns to back,* rep between * * twice more, rep between [ ] 5 times, with yarns held together purl last st.
Continue in this way, following the remaining rows of the chart. With dark colored yarn, knit the 2 strands of the edge stitch together, *k1 with light yarn, pass previous stitch over the stitch just worked, k1 with dark yarn, pass previous stitch over the stitch just worked; rep from * across. Cut the yarns and pull both through the last loop on the needle to fasten off. 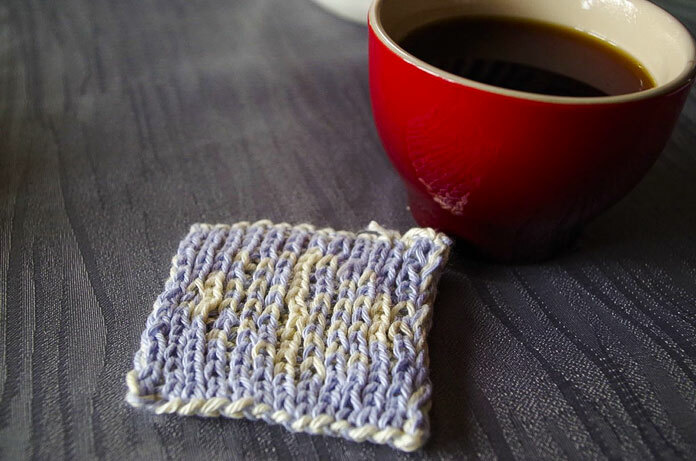 Weave in the ends, and you’ve got yourself a cute little coaster. Tomorrow’s scrappy project may use up scraps of yarn, but looks stunning. I think I found a more suitable use for Radiant Cotton to dress up your table for the holidays.